Villa Berawa is such an authentic and welcoming change to all the moderrn resorts and villas on Bali, with its collection of villas designed in and around Joglos (traditional Javanese wooden structure), crafted with artistic handmade soft furnishings and other sustainable authentic materials. As a dining option, Berawa a unique traditional restaurant named Dapur Berawa with its tasty Indonesian cuisine and a natural of ambience. 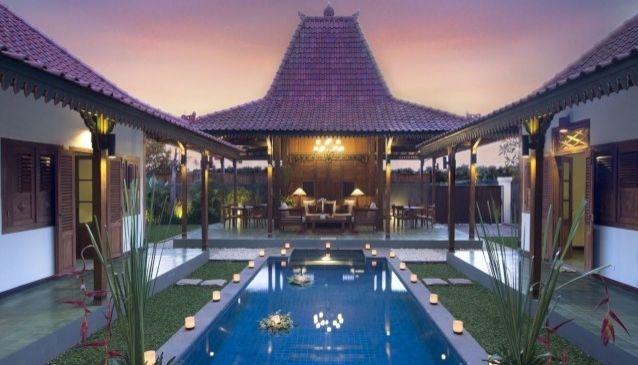 The villas are located right in the central area of the beautiful Berawa Beach and the green rice fields, adjacent to the popular of Canggu area, 10 minutes drive from the attractive Seminyak shopping area, and only 30 minutes drive from the famous sacred floating temple of Tanah Lot.